To work in a school system where health and physical fitness are seen as important aspects of a comprehensive educational program. Elizabeth is my host teacher for student teaching. Mentor Teacher: I worked under Kelly's supervision to create a new dance unit, which she now uses. Ray was my professor for four classes thoughout my physical education mayjor, one of which was an independent study. Julie was a lab instructor at CMU and also was my observing teacher during my classroom instruction hours. Patrice was my observing teacher while I was working on meeting my diverse educational experience in Detroit, Michigan. Taking courses in Chemistry to become certified to teach the subject and to eventually get accepted into a Master's program in exercise physiology. vAssisted K-2 graders with fundamental basketball skills and demonstrated proper techniques. 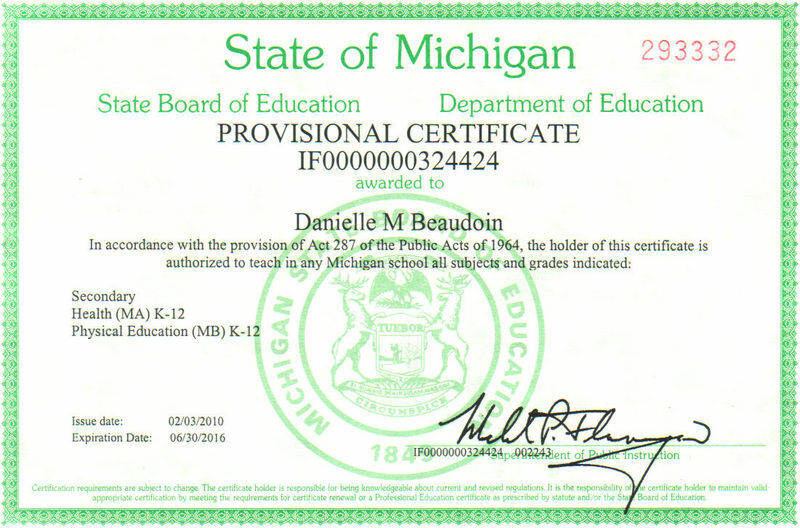 I am a guest teacher k-12 throughout the Traverse City public school system. I sub for any grade level and subject including alternative education and special education. Along with subbing, I did one month as an elementary PE teacher at Holy Angels and Willow Hills. 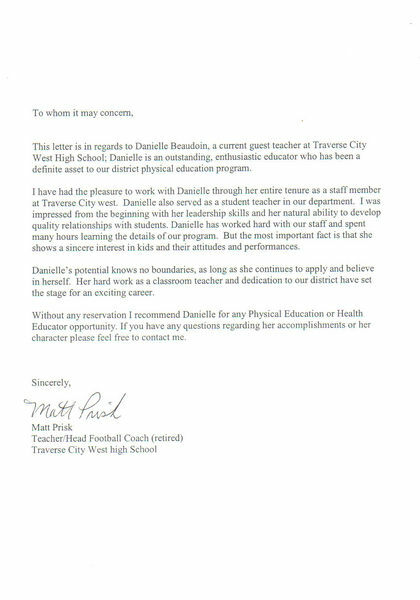 I am currently filling a part time position at Traverse City Christian as the middle school PE and Health teacher till the end of the school year. My position at North Muskegon has developed over the past couple years. I currently teach and have taught middle school health, high school health, middle school physical education, middle school media (final cut express, audacity and photoshop), middle school computers, and high school publications which includes yearbook, fundraising and a video production and weekly newscasts. Professional development: Formative assessment, sexual minority health, curriculum development, summative assessment, Michigan Model, Fitness Gram, Bullying, Michigan Association for Health, Physical Education, Recreation and Dance annual conference (3 years) and more. Volunteer Spring Break- Southern Indiana for Tornado Refief work through the National Relief Network. I organized and brought down 26 students are parents. Middle school leadership club, diving coach, assistant swim coach, volunteered to go on an 8th grade field trip, volunteered to help sell tickets at sporting events and chaperone school dances. vDeveloped and implemented lesson plans for students with special needs ranging from severely cognitively disabled to those with learning disorders.